Description: Jinsi jujube renamed as celestial date, has feature of fine quality, sweet taste, thin peel and thick meat and it is known as "King of the Fruits". 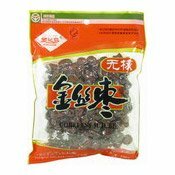 Jinsi jujube contained plentiful amino acids, vitamins and varied element needed by the human body. It is used for soul and can be eaten directly. Serving Suggestions: Ready to eat or can be added to soups. Ingredients: Coreless Jujube (100%), Preservative: E222. Simply enter your details below and we will send you an e-mail when “Coreless Jujube (金藍鳥金絲棗)” is back in stock!